Last week I introduced two Indian traders, Barney Burns and Mahina Drees. Today I continue their story. Barney Tillman Burns died on August 14, 2014. On October 2, 2015 a mutual friend told me that Mahina Drees Burns was looking for someone to help her to organize and photograph the collection of masks that she and Barney had assembled over a period of decades. Of course I indicated my strong interest. On March 10, 2016 I flew from Pennsylvania to Tucson at Mahina’s invitation to photograph the masks. I was there for nearly two weeks. 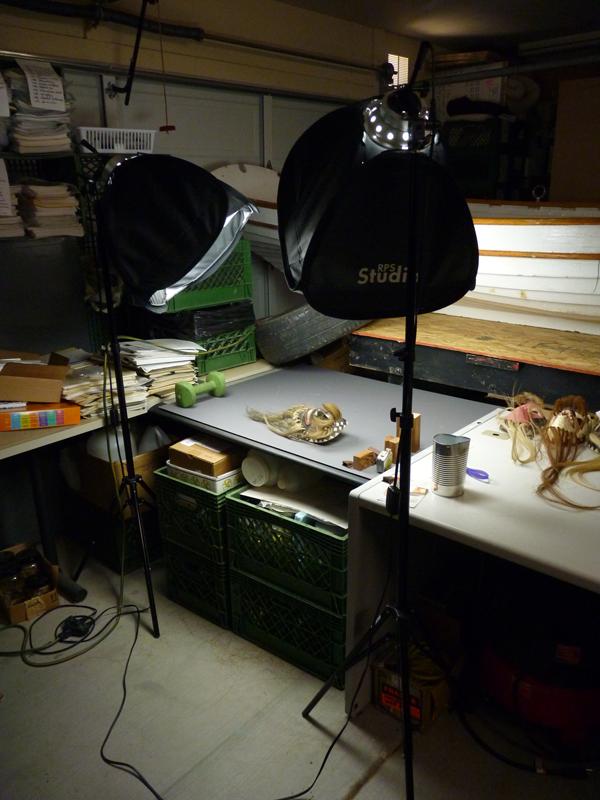 A wonderful friend, Wade Sherbrooke, loaned Mahina and me his garage to use as a studio. As it turned out, there were at least 768 masks (plus a few more that Mahina discovered after I had returned to Pennsylvania); of those, 409 were Yaqui. Here is a photo of my garage studio. The next photo is the view from Wade’s back yard of the land outside of the garage. 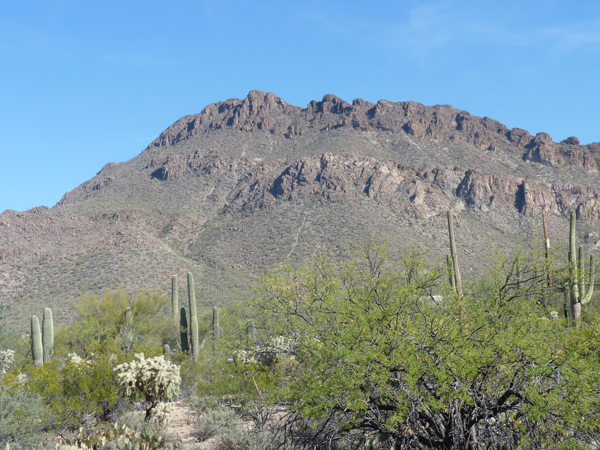 This is a mountain adjacent to Saguaro National Park West. Going into this project, I really didn’t know what to expect. Mahina and Barney had actively collected danced masks, put them away in boxes, and moved on to their next tasks. Would the masks prove to be old or recent? Would I encounter carvers who were otherwise unknown to me? Would there be masks by identified carvers that allowed me to identify anonymous masks in my own collection? And vice versa? In fact, most of the masks dated to the last 30 years or so, I discovered some carvers who were new to me, and I did make many connections between anonymous masks and others that were well documented. Today I want to introduce you to Barney T. Burns and Mahina Drees Burns, an interesting and important couple on several counts. I am uncertain how to begin, so I will simply plunge into the middle of the story and then expand from there. Barney and Mahina collected and distributed masks made by Mexican Indians, writing in pencil on the back of each mask the initials of the carver and the month and year of collection. In a sea of undocumented masks, those that passed through their hands are a welcome gift! In recent posts you have already seen masks by Antonio Bacasewa that had this documentation. Today my purpose is to visually transport you back to Tucson in the 1990s, when an assortment of interesting made for sale masks was available as a consequence of these traders’ efforts. 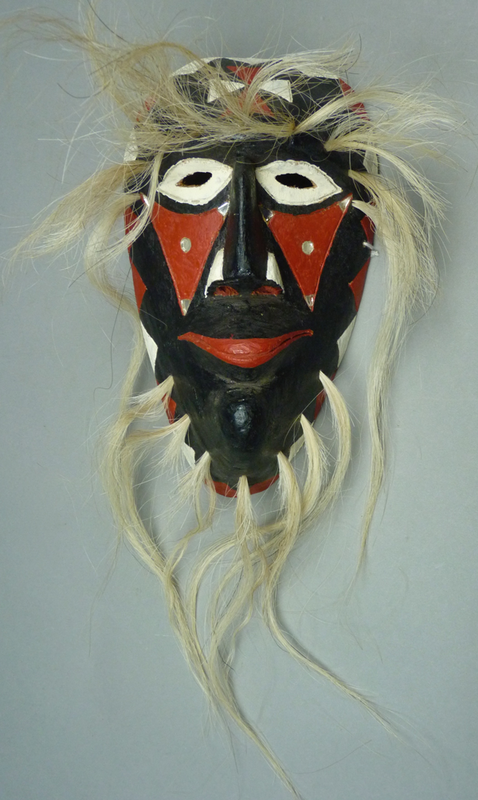 Here is one of those masks, which I purchased directly from Barney Burns and Mahina Drees in June, 1999. I will revisit this one in greater detail in two weeks. The carver of this mask, Rodrigo Rodríguez Muñoz, provided traditional style masks to Yaqui Pascola dancers in his community and his masks were popular there. In response to the opportunity to sell to American tourists and collectors, he maintained much of his usual style, but experimented with brighter paint, enhanced decorative elements, and occasional novel designs. Also, although his made for sale masks had an appropriate form, Rodrigo did not carve them to the standard of masks that he made for dancing. This is an excellent example of his made for sale carvings—a handsome mask that combines tradition and glitz in an attractive blend. In this final post about the masks of Antonio Bacasewa of Vicam, in the Mexican state of Sonora, I will show some of his charming made for sale or use masks of apes and pigs. I find him so clever and inventive. I will begin with a mask that might represent a pig or some other animal, to set the stage for the brilliant and undeniable pig mask that follows. This mask was collected by Tom Kolaz in the early 1980s from a dancer in Barrio Libre, Tucson. Here is a pig-like critter, although one might argue that it could represent a dog. In this post and the next I will continue to present Yoeme Pascola masks by Antonio Bacasewa. Today we will look at canine Pascola masks, old and new, along with an unusual made for sale mask with the face of a bull. I will start with a made for sale dog Pascola mask that was probably collected from a dancer at Barrio Libre (Tucson) in the 1980s. 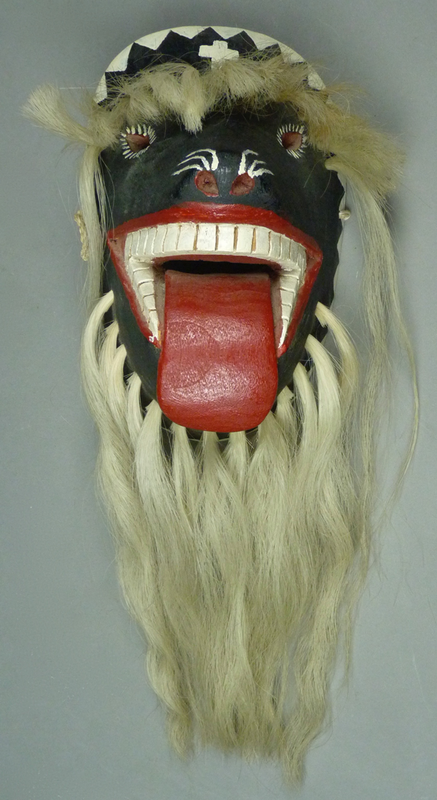 This is an excellent mask, but the design detail that really stands out is the graceful extended tongue. This is the fifth in a series of posts about Yoeme (Yaqui) Pascola masks that began on July 4, 2016. 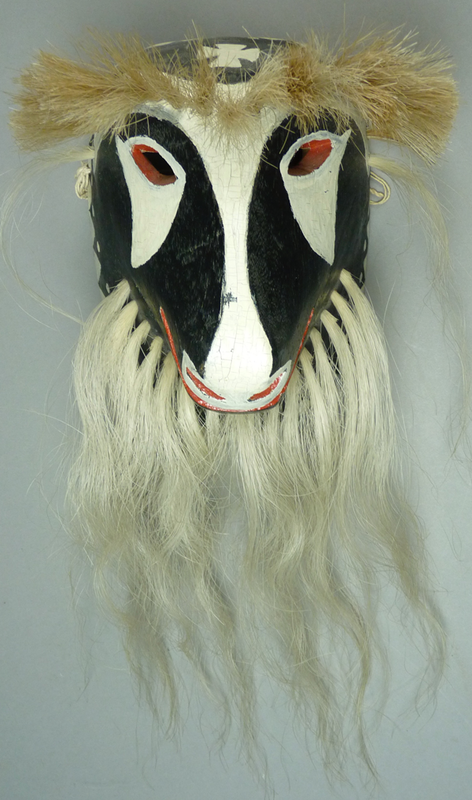 Today I want to contrast three of Antonio Bacasewa’s goat faced Pascola masks that I bought from Tucson merchants with two more Goat Pascola masks that are old and worn. Here is one that was mildly danced, to get us started. On his goat masks, Antonio was prone to emphasize flat spots on the nasal ridge and muzzle. We will see this over and over again on today’s masks.